The BuffyBB was created because I wanted to provide an enjoyable place for fans of the television shows Buffy the Vampire Slayer and Angel to communicate and interact with one another. The BuffyBB started operating on July 13, 2000 on hypermart.net. 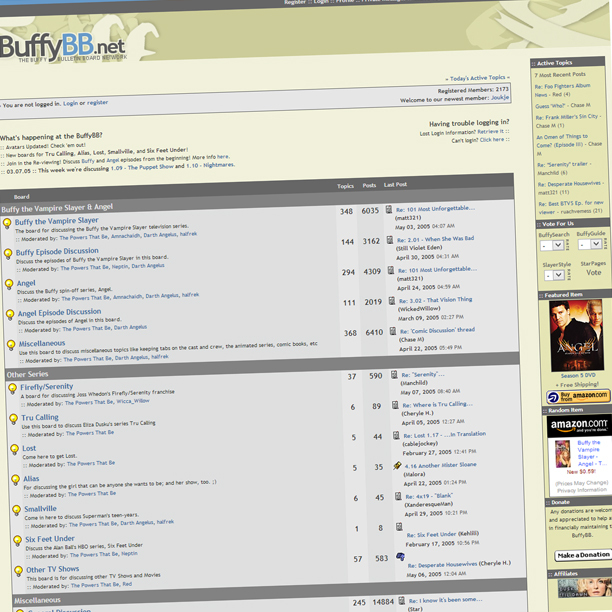 I registered it’s own domain, buffybb.net, on August 5, 2000. At the time of its’ creation there was a serious lack of decent support for such a strong fan community. At it’s peak, we had over 2,000 registered members. The board also contained a thread for each episode in the series that members could comment on and add to. Members of the community where able to create their own profile with custom avatar and information. Our member database reach around the world, and had members posting from various countries. BuffyBB.net was moderated by a few loyal members: Wicca_Willow, Lilangel, Darth Angelus, Drone, and LuckyAngel. The BuffyBB system was powered by UBB.classic.